Phil Foglio of Girl Genius introduces our show this week! Milestones this week: … NONE REPORTED! For the Beacon Searchlight we give our first impressions of Gilbert and the Grim Rabbit! Do you have a milestone to report? 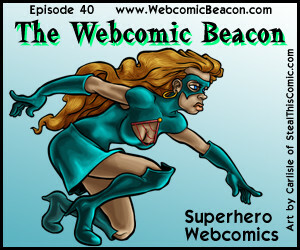 Send a notice to us at WebcomicBeacon@gmail.com. 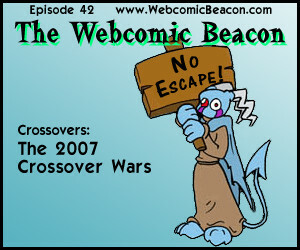 Fes and Aaron are talking about Crossovers and The 2007 Crossover Wars! Hogan of The Cameo & Crossover Archive, Reinder of Rogues of Clwyd-Rhan, and Gothia of America Gothic Daily all join us today. Mike of Prepare to Die comes on later to talk about the WAGON Webcomic Battle card game! Mark Savary talks about Pirates, as September 19 is Talk Like a Pirate Day! He looks at The Wannabe Pirates, Pirates vs. Ninjas, and Sails Of Blood! Scott Bevan of White Ninja Comics introduces our show this week! Milestones this week: Ripeville (200), Insert Comic Here (2 Years), Girly (600), Commissioned (4 Years), Anders Loves Maria (200 + 2 years)! For the Beacon Searchlight we give our first impressions on Jovian Luck (mistakenly referred to as “Space Heist” on the show). Do you have a milestone to report? Would you like us to give our (positive and/or negative) impressions on your comic? 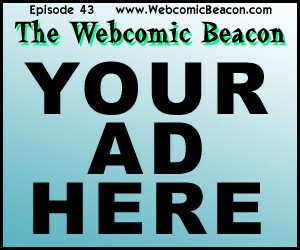 Send a notice to us at WebcomicBeacon@gmail.com. Notes: Sites mentioned: The Gigcast, Framed, The Framed Great Escape (mostly missing), Clan of the Cats, Elf Life, College Roomies from Hell, Drunk Duck, Magical Misfits, Life and Death, The KAMics, Chronicles of the Witch Queen, Project A.D.A.M., Invasion, Repository of Dangerous Things, Mind Mistress, Jenny Everywhere, Evil Overlords United, Cameo Comic, The Volet, Treasure Hunters, Pimpette & Associates, Candi, Jenny Everywhere and the Crossing Over Worlds, Halloween 2008 Cameo Caper, Angry D. Monkey, Oh, and I should mention that the cover is adapted from The Crossover Wars website. The Quasi-Official Song for Talk Like a Pirate Day can be found here by Tom Smith. Mark Savary joins Fes, Tanya, and Aaron as we just sit back a bit and shoot the breeze about webcomics in an open forum. We also rag on The Gigcast a bit, but only because we love them! And we are not at all copying them in any way…. no, we’d never do that. Zack of Unamused Comics brings us this week’s cover! Steve Notley of Bob the Angry Flower introduces our show this week! Milestones this week: Cigarro & Cerveja (10 years and ending) and The Far Reaches (200). On the Beacon Searchlight we look at, and give our impressions on Geist Panik. Do you have a milestone to report? Would you like us to give our (positive or negative) impressions on your comic? 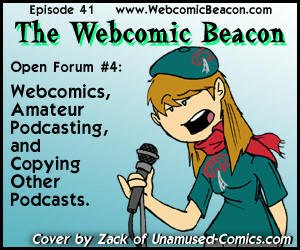 Send a notice to us at WebcomicBeacon@gmail.com. Notes: Sites mentioned: Hatpire, Last Place Comics, Saturday Morning Breakfast Cereal, Book of Biff, Perry Bible Fellowship, Kawaii Not, Minus, DrunkDuck.com, ComicGenesis.com, Rampage Network, Xepher.net, Webcomics Nation, Comic Dish, Smack Jeeves, Something Awful Comic Forum, The Gigcast, Levelator (Program), A Taste of Evil, Dresdson Codak, Jenny Everywhere, Union of Heros, Sugary Serials, Super Fogeys, Socks, Penny Arcade, Spiky-Haired Dragon, Worthless Knight, Hookie Dookie Panic, and thanks to Jinxtigr for being especially active in our chat room during our weekly live broadcast and recording! Also, Tanya Rocks The Gigcast. Kent of White Ninja Comics introduces our show this week! Milestones this week: The Gigcast, another webcomic podcast (3 years), Legostar Galactica (6 years), Sara Zero (300) , Circle vs Square (100), and Galaxion (2 years). On the Beacon Searchlight we look at Mind’s Eye of Jupiter. Notes: Sites mentioned: Might have missed a bunch of them, but here’s the Stan Lee interview with Veronica Belmont on Mahalo Daily, Xepher.net Logo Contest, Crowfeathers, Lawn Darts, Planet Karen, Lizzy, Black Hat Collective, and Challenges of Zona.